Your daily energy, of course, is finite, dwindling by the minute. Kahneman, a psychologist and Nobel winner, conducted a study that applies to every working person in the world. The study evaluated how people felt throughout the day (e.g., happy, sad, worried, competent, fatigued) and whether those feelings correlated with a specific time of day. About 900 people participated in the study, recording how they felt over the course of several workdays. That’s the data. But what’s the practical application? Ericsson, renowned for his work on the nature of expertise and human performance, studied the best violinists in the world. Specifically, he analyzed their routines to better understand what enabled their success. Furthermore, the musicians reported that rest—light naps during the day and deep sleep at night—were “most important” to gradually improving their performance. Ericsson also observed that violinists practiced for 90-minutes at a time. Then, at the end of each interval, they took a break. But why? 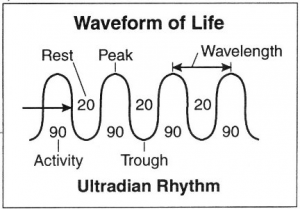 Kleitman, a pioneering sleep researcher, demonstrated that your brain can optimally focus on a task for only 90 minutes before becoming distracted (courtesy of your ultradian rhythm, a cycle of brain waves that are present during the day and at night). In other words, the same 90-minute cycles we progress through in our sleep are also present in our waking lives. There’s no getting around this, of course, no gaming the system. It’s built into our genome: Activity, rest. Activity, rest. According to the research, it’s not all that hard. But, like most goals, you need an action plan to achieve success. 1. Do your hardest work before noon. Kahneman taught us that self-confidence and energy levels are highest in the morning. Capitalize on this by getting up earlier and starting sooner, while you’re clear. Energy levels start dropping around noon, or so. 2. Break every 90 minutes. Kleitman taught us that consistent breaks reset us, making it easier to organize our thoughts, solve problems, internalize new concepts, and ultimately, focus. Capitalize on this by actually taking breaks. Don’t overthink this. Leave your desk and forget about your work for 15 minutes: Let your thoughts incubate. After you walk away from a problem, your brain is still working to solve it in the background. 3. If you’re tired in the afternoon, nap for 20-30 minutes. Ericsson taught us that napping is normal, healthy human behavior. After all, the most talented musicians in the world take daily naps. If you can’t nap, try meditating. The point here is to not feel weird about it. Don’t feel guilty or weak or immature. Napping is restorative, completely normal. And you’re normal if you do it. A few simple hacks, repeated consistently, is all it takes.